Here’s what’s happening in the world of television for Friday, November 16 and Saturday, November 17. All times are Eastern. Narcos: Mexico (Netflix, Friday): Narcos is back, but not quite how we remembered it. 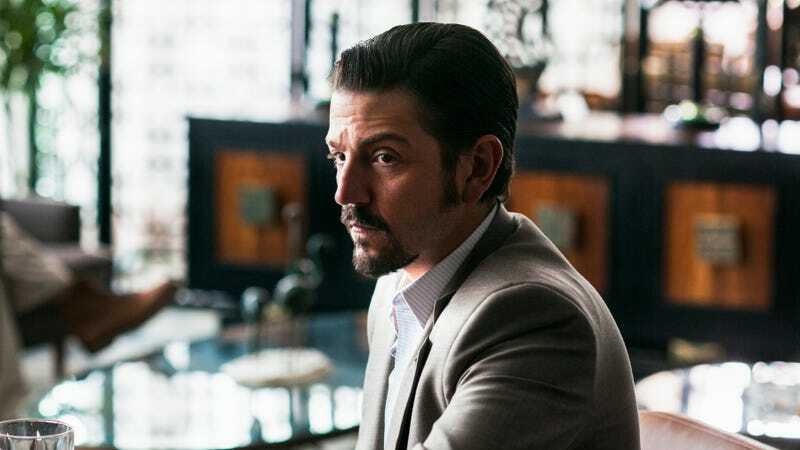 In season three, we said goodbye to Pablo Escobar; this season, we’re leaving Colombia altogether and saying hello to Mexico, a new cartel, and Diego Luna (Rogue One, Y Tu Mamá También). Rather than continue old story lines, the new season will launch a companion series following the birth of the country’s drug war. It places us in the early 1980s, as Felix Gallardo (Luna) builds an empire from a cluster of disorganized independent growers and dealers. His endeavors attract the attention of DEA agents Enrique “Kiki” Camarena (Michael Peña) and James Kuykendal (Matt Letscher), who inevitably become entangled in events that would launch not only Mexico’s drug trade but also the conflicts within and surrounding it. Check in with Dennis Perkins for his take. The Kominsky Method (Netflix, Friday): Alan Arkin and Michael Douglas head to the small screen in this dramedy about aging in Hollywood. In a city that places heavy value on youth and beauty, acting coach Sandy Kominsky (Douglas) and actor Norman Newlander (Arkin) are best friends helping each other come to terms with loss, age, and the changes and challenges that come with them. These eight half-hour episodes—brought to you by eight-time Emmy Award nominee Chuck Lorre (Two And A Half Men, Roseanne, Dharma & Greg), straying from his typical “taped in front of a live studio audience” setup—make space for a narrative often ignored by Hollywood, one that shows old men in the twilight of their careers and lives and which promises to be by turns moving and amusing. Also, it guest-stars Danny DeVito, which is a reason to watch in and of itself. The Bisexual (Hulu, Friday): After winning the Grand Jury prize at Sundance and garnering widespread critical acclaim for her gay-conversion drama The Miseducation Of Cameron Post, writer-director-actor Desiree Akhavan has taken her talents to TV with this six-part series, which she co-writes, directs, and stars in. The dramedy follows Leila (Akhavan), who begins to explore her bisexuality after breaking up with her longtime girlfriend. Leila is forced to reevaluate what bisexuality means to her—and her relationships—as she comes out to her friends and ex, realizing the difficulty in explaining to others an identity that is often misunderstood. If Akhavan’s previous work is any indication, The Bisexual will grapple with the stereotypes and misconceptions about bisexuality with humor, charm, and sensitivity. Dogs (Netflix, Friday): Netflix has fetched us a dogumentary that’s sure to make your tail wag, or make you cry, only to lick your tears away. Dogs follows six stories of good boys and girls from across the globe, exploring the universality of the powerful connection between dogs and humans. Grab a box of tissues and gear up for a ruff night.